Menta Na is a unique Daedroth deep inside of Kora-Dur, east of Kogoruhn. Molag Bal offers you an artifact in return for Menta Na's death. Molag Bal's Quest: Help deal with a lazy minion. Menta Na makes another appearance in ESO. Menta Na is the only creature that potentially drops Daedra Skin. 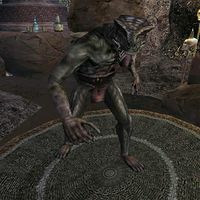 This bug is fixed by the Morrowind Patch Project. As of patch level 1.6.4, Daedra Skin can be dropped by clannfears, daedroths, hungers, ogrims, and ogrim titans. This page was last modified on 17 February 2015, at 09:09.